White paper on crime 2004 Part2/Chapter1. This chapter will give an overview of the handling,i.e.treatment of persons cleared by the police etc.,through the subsequent processes of prosecution,trial,correction,and rehabilitation(see Part4,Chapter2,Section1 for the treatment of juveniles). Fig. 2-1-1 shows the flow of treatment for adult offenders in the criminal justice system. Cases cleared by the police etc.are all referred to the public prosecutors with certain exceptions.The exceptions include those cases subject to disposition of trivial offenses,and violations of the Road Traffic Law for which non-penal fines have already been paid. In addition to investigating those referred cases mentioned above,a public prosecutor may initiate by him/herself investigation on a case when he/she becomes aware of it or receives a charge or complaint.After completing investigation,the public prosecutor decides whether or not the case is to be prosecuted in court,taking into account the existence of a crime,nature of its evidence,necessity of punishment of offenders and various other circumstances. A prosecuted case may be subject to formal proceedings or summary proceedings.When found guilty in formal proceedings,a sentence of death,imprisonment with or without labor,fine,penal detention,or minor fine may be handed down to the offender.In the case of sentences of imprisonment with or without labor of three years or less,or fines of500,000yen or less,the execution of sentence may,depending on the circumstances,be suspended for a fixed period.In such cases,probationary supervision may be put during the suspended period.In contrast,when subject to summary proceedings,the case results in a fine or minor fine of not more than500,000yen,after a quick and simplified examination of written documents. If a conviction without suspension of execution of sentence is made final,the sentence is executed under supervision by public prosecutors.Imprisonment with or without labor and penal detention are carried out in prisons,juvenile prisons,and other penal institutions.Penal institutions give correctional treatment through the execution of the imprisonment sentence,thereby aiming for the reform and social rehabilitation of offenders.Those offenders who are unable to pay fines or minor fines are detained in workhouses attached to penal institutions. Inmates are released and return to society on completion of their sentence.However,in some cases,the Regional Parole Board may decide that an inmate can be released provisionally before the completion of the sentence(release on parole in the case of imprisonment with or without labor,and provisional release in the case of penal detention;provisional release may be also applied to a detainee in workhouses).Inmates released on parole are placed under supervision during the parole period. A woman offender sentenced to guidance disposition for Anti-Prostitution Law violation is detained in a women's guidance home.If granted parole by the Regional Parole Board,she is then placed under supervision for the remaining duration of the guidance disposition. Offenders placed under probation/parole supervision receive supervision and protective assistance from probation officers in probation offices and volunteer probation officers,aiming at their reform and social rehabilitation. 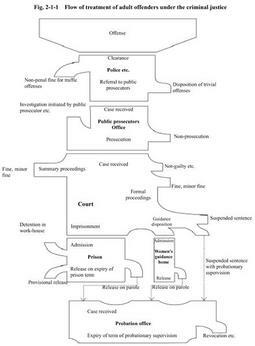 Disposition of trivial offenses: Judicial police officers do not have to conduct the procedure of referring those minor cases predetermined by public prosecutors,such as larceny,fraud and embezzlement,to public prosecutors.It is called disposition of trivial offenses.The details of those trivial offenses are reported to public prosecutors by judicial police officers monthly.